Outside the Box & Red Berry Mansion featured in San Antonio Woman Magazine! Outside the Box Productions named 10th largest PR firm in San Antonio in the San Antonio Business Journal February 2009. 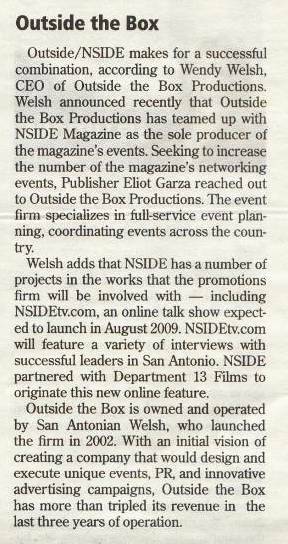 AT&T Center Names Outside the Box Productions as Special Event Marketing Firm in the San Antonio Business Journal August 2008. The AT& T Center has hired Outside the Box Productions to help produce marketing spots for private non-ticketed events hosted at the building. The AT&T Center is the home of the San Antonio Spurs, the Stock Show & Rodeo, the San Antonio Silver Stars and the Rampage hockey team. The arena also hosts numerous concerts and performances. However, the relationship between the AT&T Center and the agency is now being expanded and formalized. Outside the Box is a locally owned and operated company that offers event planning, strategic public relations, and marketing and advertising. AT&T Center opened in 2002 and is operated by Spurs Sports & Entertainment. It is owned by Bexar County.